The toughest and best question people ask me about the open journalism ideas I put forward months ago in an interactive paper for USC Annenberg: Can these ideas work in real life — i.e. in a newsroom doing journalism in live time? I rejoined live journalism in April as executive editor at KPCC / Southern California Public Radio, attracted in part by the station’s mission and the newsroom’s advantages for open journalism. In radio, KPCC had a convention of inviting audience interaction (through call-in shows). The station’s expansion included an active slate of live events onsite, in a wonderful space called the Crawford Family Forum, and an increasing commitment to in-person engagement in other venues. And KPCC was employing formal methods (the Public Insight Network) and active social media presence to invite people into coverage. Still, the challenges of daily journalism lend themselves to old formulas, and back in action I recognized the challenges of changing some of the fundamentals of the news paradigm – news comes from journalists, comment from others, etc. As I wrote in my paper on open journalism, the true promise lies in connecting professional journalism with a broadly networked information universe — a two-way connection versus one-way news distribution— to improve the quality and accessibility of good public affairs reporting. Open journalism thinking continues to percolate across the media landscape. Significantly, the role of the professional journalist continues to shift amid a torrent of information from all manner of sources. At KPCC, key players from CEO Bill Davis to web editors and radio reporters are vocal about the urgency they feel to help build new ways of doing public service journalism. Given my recent explorations, I’m delighted that open journalism thinking is figuring in more heavily all the time in KPCC’s work. 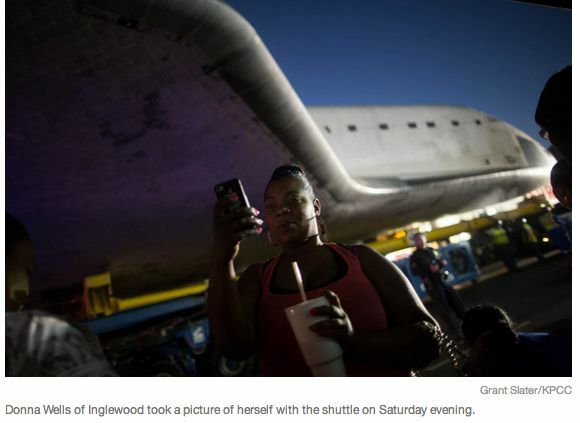 One recent example that showed the power of open exchange: KPCC’s coverage of the shuttle Endeavour being moved to Los Angeles, first by air and then by ground as it was literally inched along city streets to its permanent home at the California Science Center. 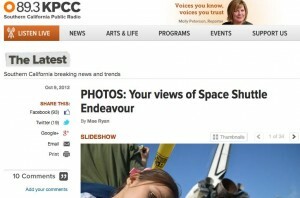 For the flyover, photojournalist Mae Ryan wrote a blog post days ahead offering tips on how to photograph Endeavour. She and colleague Grant Slater curated user photos and shot their own. They offered similar guidance for the shuttle’s slow roll through South LA, and the KPCC Facebook, Twitter and Instagramaccounts crackled with posts on Endeavour. Yet this coverage showed that traditional platforms, in this case radio, can powerfully translate open journalism thinking. This power came across most vividly as our weekend show Off-Ramp, led by its versatile and talented host John Rabe, produced a two-hour live special that combined reported and produced pieces with invitations to listeners to call in to tell their stories as the Shuttle made its snail’s-pace trip to the science center. The broadcast has staying power (listen here). Rabe interspersed live hits and produced pieces from KPCC journalists with audio from listeners who called to share what they knew and what they had experienced. Imagine, exclaimed one, being able to reach out and touch a vehicle that had traveled through outer space! Another broke down in tears remembering her father’s work in the aviation industry — “he walked to work for 45 years!” and how big a part of the family’s life was the advance of US space exploration. Rabe shared the emotion, telling his audience “I have to admit I’m a softie…” and expressing the poignancy of seeing Los Angeles’ amazing diversity on display in the people who came together to witness the shuttle’s arrival. Journalism like this turns the news into a shared experience instead of a transmission. While the shuttle’s arrival is a different kind of story from, for instance, covering a contested congressional race, the idea holds for covering public life: by drawing on professional journalists, amateur photographers, informed sources, eyewitnesses and expert guides, all toward the goal of accurate and accessible coverage. Josh Stearns (@jcstearns) has been talking today with a few folks on Twitter about community needs and journalism, drawing me and others in. It got me thinking about that ongoing question of what defines successful journalism — quality — in 2012. For too many journalists, still, quality is defined by peer recognition. This is the season of journalism prizes, of course, and it bursts into full bloom on Monday with the Pulitzer Prize announcements, previewed here by Roy Harris Jr. for Poynter. The winners of these contests, especially the investigative efforts, always inspire me and remind me of the transient but glorious experience of being recognized, as my former newspaper The News & Observer of Raleigh was in 1996 with the gold medal for public service. The Pulitzers shifted to online entries only this year and are gradually adapting to digital shift. I welcomed an antidote to insular thinking the other day at a gathering called TechRaking 2012, organized by the Center for Investigative Reporting and Google and held Thursday at the Googleplex in Mountain View. Brian Boyer, news applications editor at the Chicago Tribune, gave a short talk on art versus craft in journalism. Boyer works with clay and used an analogy of making coffee mugs with handles that were lovely but functionally deficient versus making cups that you could hold and drink from easily. Art is about beauty; craft, Boyer noted, produces utility. As a pottery lover and journalist, I loved this comparison. Journalism should be useful. I’m thinking about this as I dig into my new role as executive editor at Southern California Public Radio. Colleague P. Kim Bui, social media and community for SCPR, tweeted on Boyer’s talk this way. And Lauren Rabaino blogged Boyer’s presentation for 10,000 Words, focusing on Boyer’s three questions to ask and answer before building a news app: Who are your users, what are their needs and what can you do for them? That seems as close to gospel as anything. Boyer added that journalists need to “fight your urges” — to make elaborate timelines and maps, for instance, when a simple address-based lookup might serve users better. This isn’t to knock contest winners. Work that serves the public well often is recognized by journalism prizes. If we begin with Boyer’s starting points, journalists and our communities can come out winners. I’m new to WordPress blogging and have been surprised (sorry, naive) by the level of spam in commenting. I’ve approved 15 comments or pingbacks to my last post but have three or four times as many spam responses. Fortunately, I’m moderating comments. But one in particular was amusing — a “translation,” if you can call it that, of some of that post as quoted by KDMC’s Michele McLellan in her recent Leadership 3.0 blog entry responding to posts by me and former Greensboro News & Record editor John Robinson. A couple of bot-aggregation sites ripped down the post. Thoughtful posts by Melanie Sill and John Robinson could infer highly exegetic for editors who are still heading normal newsrooms by a digital transition. “The biggest threats to newspapers aren’t only their informed income problems and ever-proliferating competitors, though also a event costs of unwell to innovate some-more boldly—to be transformative, not incremental, in relocating forward,” Sill writes. I’ve oral with 8 or 10 former tip editors in a march of a final few months, some late and others operative in new jobs in media. From any we listened a chronicle of a same regrets: looking back, they wished they’d pushed harder, focused some-more on a universe outward newsrooms and responded some-more resolutely to a opportunities and hurdles of digital shift. Thing is, there’s still copiousness of time. We’re not during a finish of change, we’re in a midst of it. Even for imitation newspapers, there’s copiousness of upside (and copiousness of audience)—not for a shrunken chronicle of a journal format of 1992 to be profitable in 2012, though for contemporary approaches to imitation to offer readers good as partial of a menu of options in a digital era. I’ll leave that last to John. One thing I’ll say about journalism these days: there’s so much more to learn and new ways to do it. And, fortunately, copiousness of time. The Annenberg Innovation Lab has published “The Case for Open Journalism Now: A new framework for informing communities,” my online discussion paper on the emerging idea of open journalism. The web paper (which can be downloaded as PDF) includes dozens of links to open journalism in action and draws on thinking, writing and actions by people across journalism, including bloggers and nonprofit newsrooms along with print, broadcast and online journalists. It resulted from my work during the fall semester as Journalism Executive in Residence at the USC Annenberg School for Communication & Journalism in Los Angeles. Along with Nikki B. Usher, assistant professor of journalism at George Washington University and a recent Annenberg Ph.d., I gave a talk at the National Press Club on Dec. 12 on open journalism and open source influence in journalism. My biggest challenge has been extending the conversations that enriched the reporting for this paper into an online forum. I hope you’ll read and weigh in using the online response form or via email. There’s plenty to debate, and you might disagree with my conclusions, but certainly those who consider journalism a public good have reason to consider the arguments from me and others included in this paper.